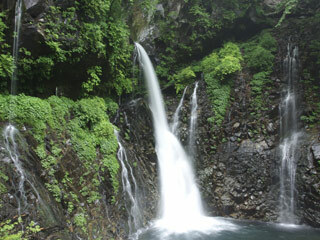 Urami waterfall (裏見の滝, uraminotaki) is one of the three great waterfalls in Nikko. It is located in the small valley of Nikko. Because it is located in the valley, it is very quiet and cool even in summer. It has 20m (66 ft.) high, and 2m (6 ft.) width. There are many unnamed waterfalls around the fall, and on the way to the fall. Japanese famous poet, Matsuo Basho (松尾芭蕉) visited this fall and made a poem. There are free parking and restroom. On the way to the fall, you have to walk in the valley. Not many people visit this fall. So, you can enjoy quiet moment here. It used to be able to access behind the fall, but at 1902, there was a minor rock falls and closed the access to the back spot. Japanese famous poet, Matsuo Basho (松尾芭蕉) visited this fall and made a poem. You may come up your new poem here. Beginning of summer stay this waterfall for a while.